As time progresses, the windows or doors in a home may begin to stick or experience gaps or cracks in the walls surrounding them. Gaps or cracks around your doors and windows force your heating and cooling systems to work harder to maintain a comfortable temperature throughout your home. Additionally, these problems can also be indicators of some serious foundation issues. If your doors or windows have a tendency to stick, have cracks surrounding them, or are separating from the walls, contact the foundation repair experts at Rapid Foundation Repair, as we are the foundation repair authorities in South Dakota and the surrounding area. Poor soil compaction: If the soil is not compacted correctly at the time of construction, it can gradually shift, causing the foundation to settle and shrink. Hydrostatic pressure: When there is a significant amount of rain, the soil around your foundation becomes more saturated than usual which increases the hydrostatic pressure in the soil. If this pressure builds up too much, it will push on the foundation, resulting in shifting and settling. Erosion: Heavy rain can also instigate erosion, washing away the soil around and underneath your foundation. This process creates voids that cause the foundation to settle. Soil shrinkage: These voids can also form in dry, drought-like conditions when the soil compacts, causing it to shrink and shift. 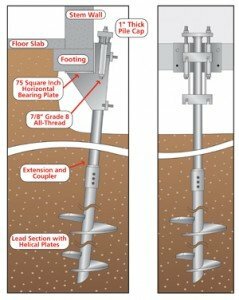 The essential solution for a settling or shrinking foundation is to install foundation piers. These piers are installed beneath the failing components of the foundation to ensure support and stability. First, the piers are driven into the ground until they become settled in the stable soil beneath the frequently shifting top layers and the weight of the structure is transferred onto them. Then the piers are relied upon to lift the foundation to its original level and maintain that it is fully supported. If your windows or doors have begun to stick or become difficult to open, do not assume that humidity is the culprit. Wedge shaped gaps above or below the doors, molding that is pulling away or cracking, drywall cracks surrounding the doors or windows, or cracks in the foundation near the windows or doors are often indicators that the problems with your doors or windows can be attributed to the foundation. 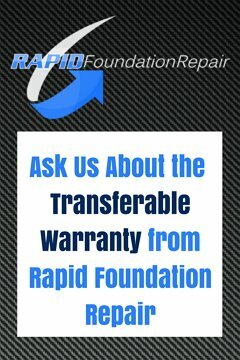 If you experience any of these issues in your home, contact Rapid Foundation Repair right away so we can work together to determine the best solution for you and your home!